VATICAN CITY (Reuters) – The Roman Catholic Church must open itself up to women in the next pontificate, giving them more leadership positions in the Vatican and beyond, according to a senior cardinal who will be influential in electing the next pope.�In an exclusive interview with Reuters, Cardinal Leonardo Sandri, 69, an Argentine, also said the next pope should not be chosen according to a geographic area but must be a “saintly man” qualified to lead the Church in a time of crisis. He said one of the greatest challenges facing the Church was trying to win back those suffering from a “loss of faith” who had “turned their back on God” and the Church of their fathers.�Sandri, an experienced diplomat and past number two in the Vatican bureaucracy, is expected to wield great influence in the choice of the man to succeed Pope Emeritus Benedict XVI. At present women, most of them nuns, can only reach the position of under-secretary in Vatican departments, the number three post after president and secretary, which so far have been held by ordained men. 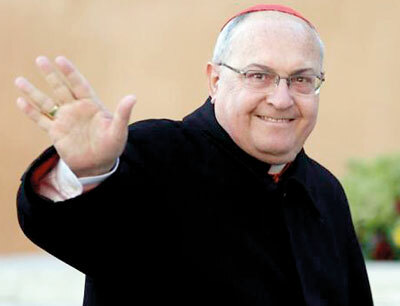 Currently only two women are under-secretaries, one a nun and one a lay woman.�Sandri, a son of Italian immigrants who has been mentioned as a papal candidate, said it was “only right” that women should have more key positions in the Vatican administration “where they can make a very important contribution because of their qualifications”. The Church teaches that women cannot become priests because Jesus willingly chose only men as his apostles. Sandri gave no indication that the rule could be changed.�Sandri spoke as cardinals from around the world gathered for preliminary meetings on Monday ahead of a closed-door conclave to choose a new pope which is expected to begin in the Sistine Chapel around March 10. He said the next pope should have holiness, physical strength, communications skills, and the ability to govern.�“The problem is finding the four qualities together. Sometimes someone has an excess of one quality and less of others … for me, the most important thing is that he be a man of faith who is not afraid,” the cardinal said. “I would like to see the new pope be someone who above all is, if not yet a saint – that is difficult to ask for – someone who is at least walking towards sanctity through a life of humility, work, prayer and witness to the Gospel,” he said. Parts of the Vatican’s central administration, known as the Curia, have been faulted for not preventing some of the scandals and mishaps that marked Benedict’s troubled papacy. There has been much speculation that the next pope could be a non-European, perhaps from Africa or Asia, both places where the Church is more vibrant and less ossified than in Europe and in other developed areas.�But Sandri warned against picking a pope by his passport. “I am skeptical about relying on geographical definitions. Someone should not be elected pope just because he is not a European,” the cardinal said.”We have to choose the best person, the one who has all the personal qualities of health, vigor, preparation and experience, without regard to geographical origin,” he said. Cardinal Peter Turkson, 64, from Ghana, who heads the Vatican’s justice and peace department, is seen as a leading African candidate.